The facility is designed for development and investigation of novel ion-plasma nanotechnologies, as well as for realization of ion nitriding and coating deposition technologies for various commercial products. Features: Possibility to realize ion and plasma treatment of materials surfaces, coatings deposition processes and their different combinations. •	Scanning electron microscope Phenom 3G ProX with x100,000 magnification and determination of the chemical composition of the samples (both conductive and non-conductive materials). •	Metallographic microscope METAM LV-41 with x2000 magnification and possibility of digital imaging for processing and analysis. •	Tribometer Calowear (CSM Instruments) for determination of the coatings thickness (> 100 nm) and coatings wear resistance (spinning ball on a flat substrate). •	Microhardness tester PMT-3M with a load range from 0.0196 N to 4.9 N.
•	Precision cutting, grinding and polishing machines for probes preparation. •	Ultrasonic bath for sample pre-cleaning. •	Drying oven (up to 500C) for samples thermal treatment. 1. D.A. Karpov, V.N. Litunovsky "Multilayer nanostructures and nanocomposites - a new generation of coatings to modify the surface properties of materials", Review O-103, FSUE “D.V. Efremov Institute of Electrophysical Apparatus”, St. Petersburg, 2008, 93 p. (in Russian). 2. D.A. Karpov, V.N. Litunovsky "Plasma-immersion ion implantation (PIII): physical bases, use in technologies", Review O-104, FSUE “D.V. Efremov Institute of Electrophysical Apparatus”, St. Petersburg, 2009, 65 p. (in Russian). 3. D.A. Karpov, V.N. Litunovsky "Non-traditional technologies of the material surface property modification with concentrated energy fluxes”, Review O-105, FSUE “D.V. 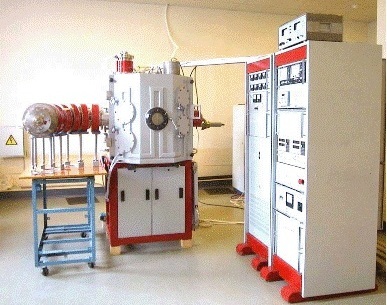 Efremov Institute of Electrophysical Apparatus”, St. Petersburg, 2012, 27 p. (in Russian).